Forested areas provide important breeding habitats for the turtledove (Streptopelia turtur) in Dadia-Lefkimi-Soufli National Park, Northeastern Greece. We censused the birds in two forested habitat types using the point-count technique at 60 sites during the breeding season (from mid-April to mid-June) in 2001 and 2002. We sampled vegetation structure at the same sites by measuring horizontal (tree species and density in different size classes) and vertical (percentage canopy closure in dominant, intermediate, suppressed and shrub layer) characteristics within 0.04 ha circular plots centred on the established points. Univariate and multivariate statistical techniques were employed to examine the response of the turtledove′s presence to habitat differences between used and unused sites. 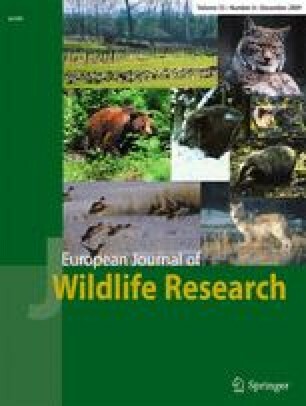 The results of this study indicate that habitat structure influence the presence of the turtledove during the breeding season. Middle-aged forest stands particularly those dominated by pine trees with low percentage cover in understory are likely to be beneficial to breeding the turtledove population. A combination of multipurpose forestry operations allowing development of managed woodland in mosaics with other habitat types could provide high-quality habitats for a wide range of wildlife species including game and non-game species in the area. Silvicultural methods of maintaining appropriate breeding habitat for turtledove in Dadia-Lefkimi-Soufli National Park (DLS NP), which are in conflict with commercial forestry, are discussed. We wish to thank Mr A. Vasileiou who helped with map constructions and R. Taylor, S. Alatzias, K. Bakaloudis, P. Goudiakas, E. Vlachou, E. Dalmari, T. Papadopoulos and D. Tsalagas who provided assistance in the field. The authors declare that the experiments comply with the Greek and EU laws.